The best convention…I never got to. 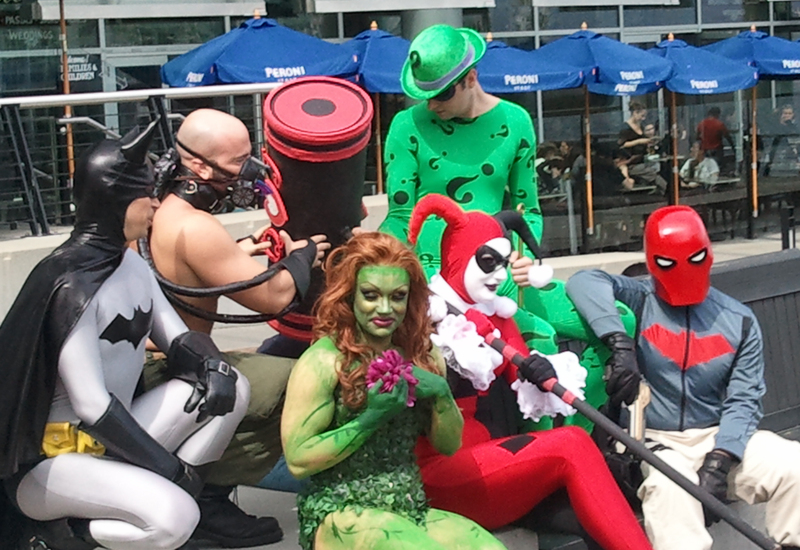 Vancouver FanExpo 2012 | Damian Trasler's Secret Blog - Do Not Read! ← 10 reasons why being a writer ROCKS! 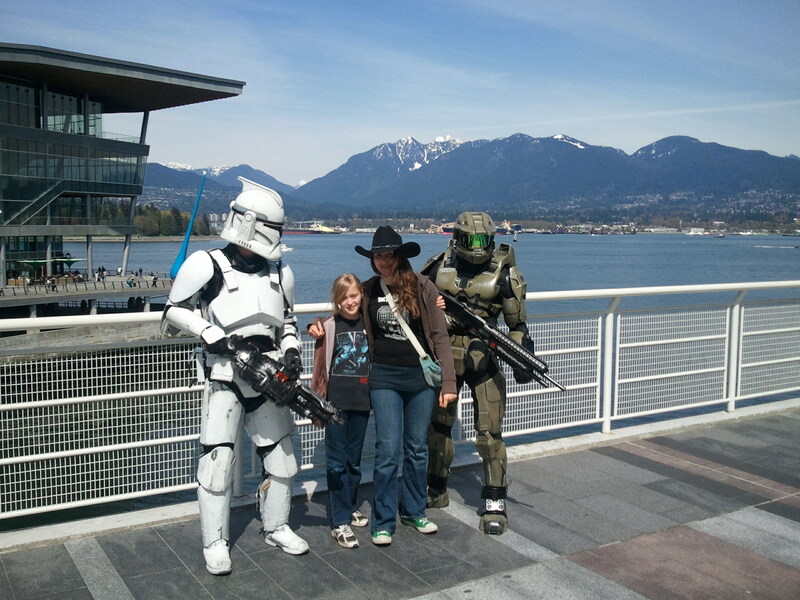 Middle and Eldest Weasel meet a Clone Trooper and The Master Chief. It’s the first Fan Expo here in Vancouver. Sure, we have V-Con, and probably there are other comic-based events happening now and then but there’s one crucial difference. We were going to this one. We’d missed San Diego Comicon the year we were in town, and the planned trip to Emerald City didn’t pan out. Flu prevented our attending the Bellingham Comic convention. So we checked out the website. We downloaded the vouchers that would get the younger weasels in free. We didn’t buy the actual tickets though. How busy could it be? Hey look! 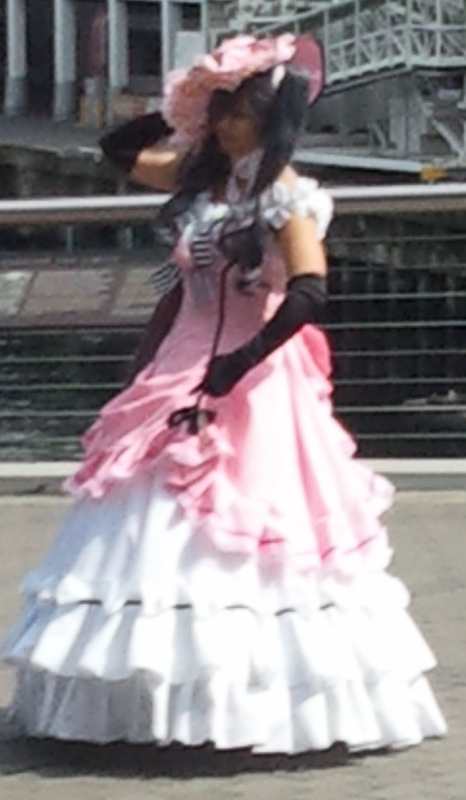 It’s…er…ah…Well, her dress is pretty. Maybe we should have raced to the Convention Centre as soon as we woke up, but it was a lovely day. We walked the dog, dawdled at a yard sale…we enjoyed ourselves. And meanwhile, it seemed, every other person in North America was arriving at the Convention Centre. When we reached the doors at noon, they were having to turn people away, since they were already sold out. 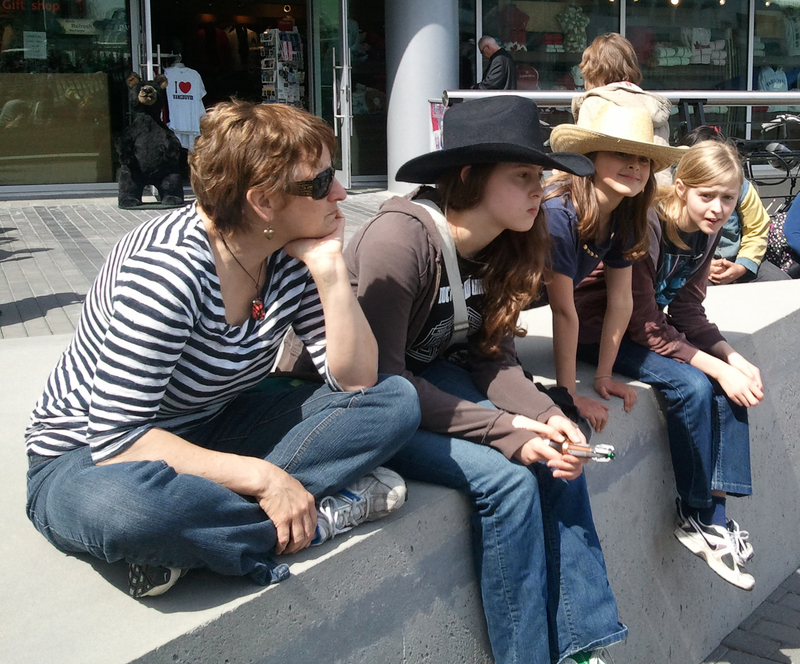 So…we took advantage of the sunshine and the wandering cosplayers to amuse ourselves. It was a great spectacle, and we probably saved ourselves a fortune by not wandering the halls and seeing the wonderful merchandise, or the various stars arrayed to sign their photos…But we’ll be back for next year. And we’ll be in our OWN costumes. I will not be going as Supergirl. Even though I have the abs for it…. What’s the greatest event YOU’VE ever missed? This entry was posted in Emigrating with Weasels and tagged Batman, comics, convention, Fan Expo, Harley Quinn, Poison Ivy, Supergirl, Vancouver. Bookmark the permalink. My son went to comic-con in SD with his Dad the year before the year it got HUGE! Now the SD one is such a BD that friends of ours will buy their tickets online the minute, nay second they go on sale and spend the entire weekend there. Personally, I think it would be fun but I haven’t made the effort yet to make it happen. I used to collect Spawn when it first came out. During our split, my exhusband took my bin of Spawn comics. I wanted to work up to San Diego slowly, going via Bellingham (twenty five people in a hall) up through Vancouver (Tweny thousand) to Seattle (Thousands of thousands) to SD (REALLY FAMOUS PEOPLE IN A LOT OF PLACES!). But it was not to be…..
BTW Taking your comics was a low move. Sorry that you did not make it in to the convention – BUT – Glad that I was able to pose with your 2 young ones along side my Clone Trooper friend. Thank you so much for that moment! Not getting inside meant that the cosplay WAS the convention for all of us, and you two were an amazing sight to meet first. You actually set a high bar for the rest of them! Pingback: Suit up! It’s Vancouver Fan Expo time! | Damian Trasler's Secret Blog - Do Not Read!